Pythons are menacing creatures that are known to strangle and swallow their prey which can be anything from rodents to bigger animals. But sometimes even these terrifying reptiles can get stuck in difficult situations when they bite more than what they can chew. 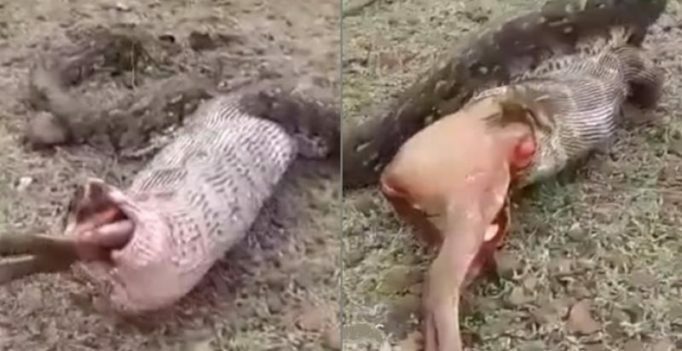 A python in Sawantwadi village of Maharashtra was filmed by shocked locals as it struggled to ingest an entire deer it had swallowed and was soon forced to regurgitate the animal. The snake tried to perform the seemingly impossible feat for minutes until the locals poked it with sticks and it had to spit out the deceased deer which it had preyed upon near a river.